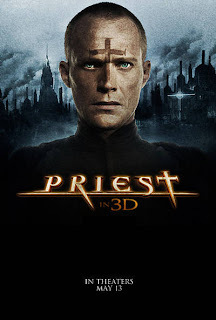 I want to start this review by stating that I have never read the Priest comic books, nor am I a student of any of the Priestly lore. However, I am utterly obsessed with religious and catholic iconography in films, books, roleplay, art. Well or poorly executed, it is an aesthetic I have always loved. Mix that in with a little post-apocalyptic cyberpunk, and I was raring to go for Priest. A nifty little animated opener describes the history of the world through the war between humans and vampires. Forget brooding reflections of immortal sexuality. Not a Count, Cullen or Compton in sight, these vampires are strictly blind, semi-humanoid, feral beasts. And they want all human's dead! Pit these soulless, godless demons against a crack troop of inhumanly gifted mortals who beat the vampires into submission. The Catholic Church, stealing their moment have subjugated the people to a fascist theocracy. It's brutalism is beautifully represented through Orwellian style mass prayers and automated confessional booths. 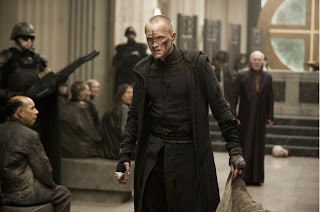 Paul Bettany is one of my favourite actors at the moment, perhaps because he seems to take all the tormented religious roles that hit just the right note with me (Silas the Monk, the archangel Michael, and now Priest). He is no less tormented and beautiful here. Even with his disturbing body modification, Bettany's soulful eyes and softly spoken tones suit the Priest perfectly. 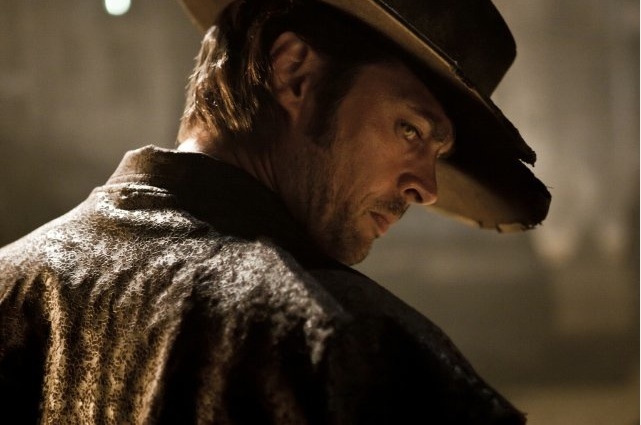 I have but one problem: why do directors insist on forcing him to do his American accent? While British actors should have this talent to slot into films based across the atlantic, why is it foisted upon him when playing an angel, or post-apocalyptic demon hunter? Surely the American accent is not required, and Bettany's brilliance shines far brighter when he is allowed to use his natural voice, (see A Knight's Tale for proof). Nevertheless, he is excellent in Priest and manages to leave his strangely attractive thumbprint on an unusual, distant character. Acting props must also go to the severely underused Karl Urban, another of my top actors. The southern accent he perfected for Dr McCoy is back and better than ever. Spending half the film on a train is no way to treat such a fine actor, but when he is given the chance he injects some much needed energy into the jedi-like priests. He even manages to make conducting explosions to Mozart's Requiem seem dramatic and not as ridiculous as it sounds. ... him too. Damnit this is a hot film! While the art direction for this film is stunning and bleak, my main problem links in with an issue I have with most recent thriller or vampire films. Darkness. I don't possess a high-tech, high-def, high-price home cinema system (lord knows I wish I did). I watch most of my DVDs on my laptop. The screen is fairly smudged and even on the highest brightness as soon as all the lights go out I lose any ability to pick out fine detail in any film. Overall, Priest has so much potential as a film setting and leaves all the right avenues open. I only wish it had done better at the box office - I thought sequels were supposed to be obligatory!